Het studio-appartement (50 vierkante meter / 500 vierkante voet) bestaat uit onlangs gerenoveerde suite van kamers, met een eigen terras, in een 15e eeuws middeleeuws gebouw. De studiosuite bevindt zich binnen de overblijfselen van de oude muren van het middeleeuwse stadscentrum. We hebben er alles aan gedaan om de ouderdom van deze charmante studio tijdens de renovatie te behouden. In hetzelfde complex hebben we ook een appartement met een slaapkamer te huur op een trap, vraag ons voor meer informatie over onze andere drie appartementen met twee slaapkamers. De moderne badkamer, keuken en woonkamer maken het tot een ideale plek om te ontspannen tijdens het verkennen van de regio. Het appartement wordt verhuurd op een wekelijkse basis of een verblijf van minimaal twee nachten. Afgesloten douche met verwarmd handdoekenrek. De Bardin Suite ligt in het centrum van de oude stad en op een steenworp afstand van prachtige bakkerijen, cafés, restaurants en boetieks. Er is een telefooncel op het dorpsplein op drie minuten lopen. Lejligheden er fint indrettet med hygge- og soveafdeling. Udstyret i køkkenet er godt. God oplevelse at bebo lejligheden. Kelly er en meget venlig og imødekommende værtinde. Lejligheden er fint indrettet med en hygge- og en soveafdeling. Jeg nød at kunne være midt i byen og bl.a. kunne besørge indkøb til fods. Gåture i den gamle bydel var helt klart dejligt for mig. Very enjoyable stay. 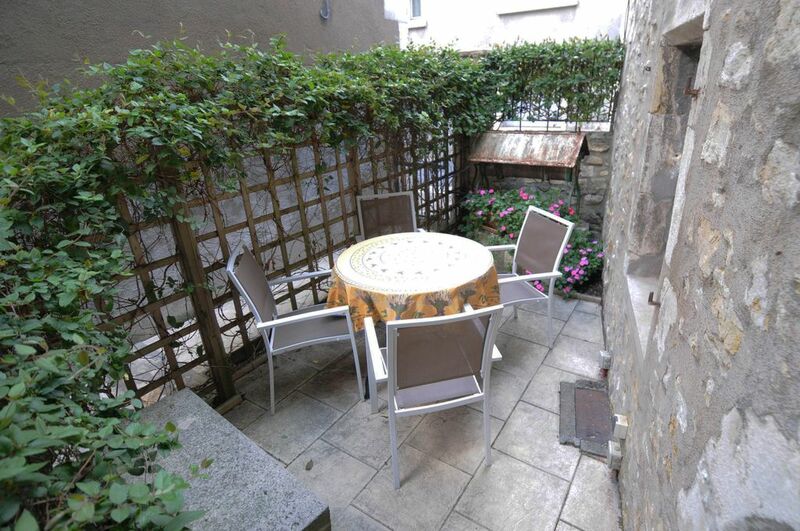 Great ground floor gite with everything you could possibly need, including a terrace to enjoy a glass of wine. La Charite sur Loire is charming with much to see in the surrounding area. Kelly and Byron very helpful and informative. We are happy you enjoyed your stay in our Bardin Suite. We hope to see you here again soon! This medeival town was the perfect place to explore the area. La Charite sur Loire itself was a delight to walk through....lots of history! (LOL!) Byron and Kelly are wonderful hosts. Shops and restaurants are just a short walk away. The studio is large and the kitchen and bath are very modern....wonderful shower! The window over the kitchen sink is at street level making the apartment more of an"English Basement". There is a complete and separate kitchen which is very nice and totally unexpected for a "studio". It's amazing what Byron and Kelly have been able to do with these ancient buildings. A very enjoyable stay. PS...definitely take Byron's invitation for a tour.... his enthusiasm for La Charite is contagious! We are happy you enjoyed your stay in our Bardin Suite and La Charité-sur-Loire. Byron enjoys showing our guests the little hidden corners of town. We hope to see you here again! We stayed for two weeks in Bardin Suite. This is a beautiful area and good for a truly "French" experience. Byron and Kelly provided the information we needed to see the best of the attractions in the time we had there. They were always available to help us enjoy our time in La Charite. Everything you need - shops, restaurants etc is within easy walking distance but you can also rent a car from nearby Nevers if you want to explore the French countryside. Bardin suite is nicely furnished and we enjoyed our private patio immensely. Thank you for your kind comments. It was a pleasure to meet both of you. We wish you all the best in your future travels. We hope to see you here again soon! Very nice well located apartment, with good services and kitchen. The hosts we very good and helpful. We had a problem with the TV and they came around straight away and fixed the set up. An interesting small town on the Loire, and as we were traveling by bike it was a welcome stop for three nights to recharge and do the washing. We visited Pouilly-sur-Loire and had a good lunch and visit to a cave. We are happy you enjoyed your stay in our Bardin Suite. We hope to see you here again soon. We had been meandering in France for a month, moving on every night or two, when we noticed the listing for Kelly & Byron's gites, and decided to settle down for a week in La-Charite-sur-Loire in a part of Burgundy we had not been before. Bardin suite was just our size, and probably the most comfortable place we have stayed of our many European vacation rentals through the years, and maybe the only one that was exactly as represented. They've thought of everything. The comfortable bed, the nice towels and linens, the easy chairs, the well furnished kitchen, the rain shower bath, and even more importantly to us, the good reading lights -- combined with Kelly's graciousness to make us grateful that we had found such a warn, pleasant place. The Harkers are such nice people, and we really enjoyed their hospitality. Byron's enthusiasm for his very interesting adopted town is infectious, and his local anecdotes and tidbits bring its history to life. Parking is right in front, and there is much to see and do within an hour or two. We liked it so much that we wanted to stay longer, so we did! We are happy to hear you enjoyed our Bardin Suite and La Charité-sur-Loire. It was a pleasure to meet you! We hope to see you here again soon.